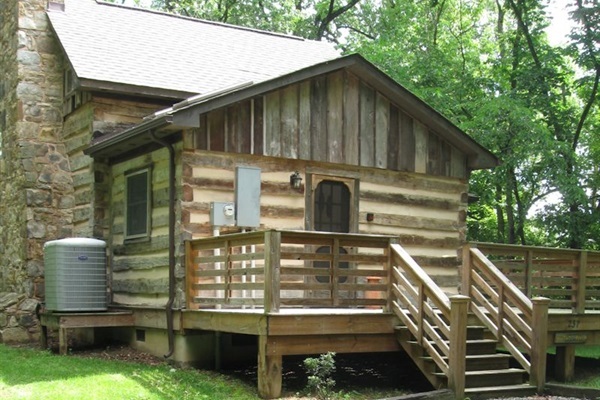 Vintage River Cabin has very easy and convenient access to the town of Luray which centrally located to all activities such as Skyline Drive hiking, Luray Caverns, canoeing, horseback riding, and much more. This authentic 1700's circa river front log cabin, complete with chinking, antique plank floors throughout, country porches, outside 7 person hot tub, is located just steps from the Shenandoah River and features an observation deck on the river with fabulous views and easy access to the river for swimming or fishing. What a perfect honeymoon getaway with fabulous views by day and star gazing from the hot tub at night. Enjoy the view of small rapids on the river and access to a one hundred year old fishing spot. The views also include the beautiful GW National forest mountain range across the river. The amazing huge stone wood burning fireplace is a marvel to be enjoyed for decades to come. Imagine lying on the floor in front of this crackling fireplace on a cool fall day or watching the snow blanket the beautiful forest. It doesn't get anymore romantic than this. Firewood is provided for the fireplace.